My mother instilled in me the notion that all theater must have a sense of humor. Much as I frequently question this idea, it rarely leaves my head. The argument isn’t that stories can’t be sad, or even wholly bleak. It’s more that even in the darkest of tales, a bit of light has to shine through. That that small laugh, or tiny cracked smile, isn’t there just for the audience’s relief–it reflects our ingrained human need to laugh in the face of horror and despair. Can we ever really leave that out? Two monologues combined into one evening, Sea Wall and A Life prove an interesting study in laughing in the face of horror. Simon Stephens’s Sea Wall begins the evening, and it is a grim piece. 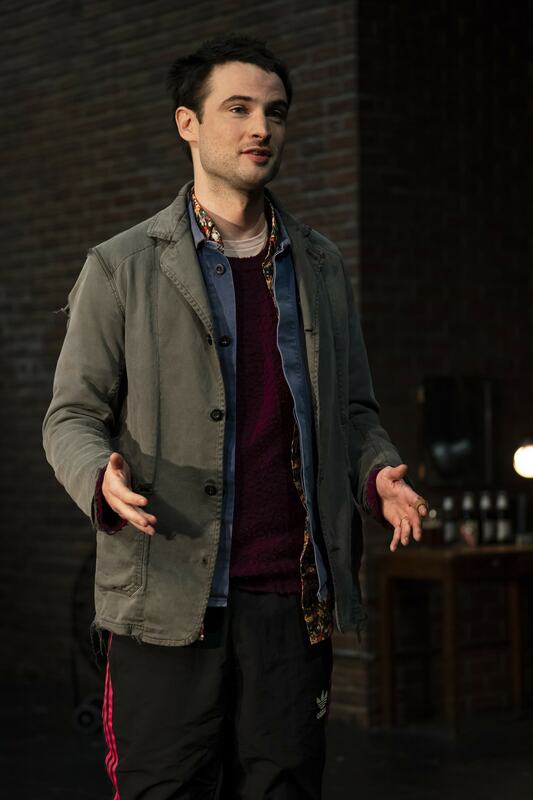 On a two-level brick set (by Laura Jelllinek) that faintly evokes a pier, Alex (Tom Sturridge) speaks haltingly about himself, his family, and their straightforward life. Even in a charming early section, a deep feeling of foreboding hangs over every word. Little comfort is provided by Sturridge, who has a cold presence as a performer. Sturridge’s work is, as always, wonderfully precise–but something about him here just suggests oncoming doom. Sea Wall does indeed take a turn for the unspeakable, and the effect is oddly numbing. As a horrific tragedy strikes Alex’s life, I felt an increasing distance from him with each word. Stephens’s text does not lack in specific, humane details. But as played by Sturridge, Alex appears so deadened by these events that I, too, found myself shutting down. As intermission arrived, it felt like the darkness would face little resistance in this evening. Thankfully, Sea Wall is complemented by the second play, which takes a different tack. Nick Payne’s A Life solves the problem of numbing despair by telling two stories at once. One is about the narrator’s father’s heart attack and ensuing decline, leading to his death; the other is that of the narrator’s wife’s pregnancy, as she endures complications but ultimately gives birth successfully. The speaker rapidly switches back and forth between the two tales, which take place years apart. Besides obviously reflecting both poles of “a life”–the beginning and the end– this approach allows Payne to hit a tonal balance. One moment, the speaker’s father is weeping over his sink (the dark); the next, his wife is arguing with him over baby names (the light). Jake Gyllenhaal is wonderfully moving in A Life. Gyllenhaal can, at times, push overly hard as a stage actor; I felt this particularly in his last Payne play, If There Is I Haven’t Found It, where he strained to project anguish. Here, though, Gyllenhaal is far more natural, matching nervy energy with wry amusement. He seems a little frightened to talk to us, which proves endearing. But he’s also excited: excited to release the burden of his grief, and let others own it with him. Both plays are attempts to put words to something unspeakable: the moment of loss and the process of grief. Once followed by A Life, the numbing effect of Sea Wall starts to feel more apt. We see Alex at an earlier stage of grief, where just speaking the loss out loud is an odyssey. There is an unspoken throughline, lightly suggested in Carrie Cracknell’s simple staging, between Alex’s state of shock and the open, honest processing of A Life. At one point late in A Life, Gyllenhaal steps briefly out of the light, overwhelmed by the weight of his loss: “It’s too hard. I miss him too much.” But he keeps talking, because he needs to share with us. My own need for a light amidst the darkness is, arguably, just a need for easy comfort, a comfort that art is not, and should not be, obligated to provide. Sea Wall is the tougher of these two works, without a doubt. Yet it’s hardly sentiment to say that tragedy and beauty live side by side, and any work that provides only one is going to feel incomplete. Maybe that’s why Cracknell concludes the evening with the two men on stage together. As Gyllenhaal’s light fades and he makes an exit, that light shifts to Sturridge, still stationary. He’s not ready to follow yet, but at least he’s talking.